Wellness for the World: Do I Drink Alcohol? I often hear clients tell me that they've heard that drinking a glass of red wine every day or even a beer per day is actually good for your health. Well, in my opinion no alcohol is good for you and the nutrients derived from drinking the wine can be obtained in much healthier ways and without the alcohol content. So with that said, I don't drink, right? Wrong! So how can drinking fit into a healthy lifestyle? 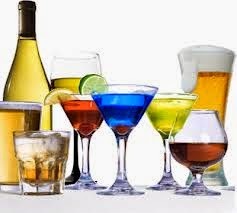 The concentration of alcohol in the beverage - The greater the concentration, the faster the absorption. The type of drink - Carbonated beverages tend to speed up the absorption of alcohol. Whether the stomach is full or empty - Food slows down alcohol absorption. So with this information we'll first discuss when we drink. You know the routine, you go out for dinner and the first question asked by the server is "can I start you off with a drink." The is actually one of the worst times to drink. When your stomach is empty the alcohol absorbed in the stomach is on a fast track to your blood and to your brain, so do yourself a favor and leave your drinking for the end of the meal and not the before your meal. If you insist on drinking at the beginning of your meal to "play along" with everyone else at the table, make sure you have a protein and fat snack prior to heading out to eat. I know this is a bit counter-intuitive but it truly works well. We can also take this one step further in recommending that when you drink also eat some fat as you're drinking. Perhaps some nuts, olives, cheese, avocado and/or guacamole because the fat will also slow the absorption of alcohol and also slow the release of glucose in your body. The next area to consider is what you are drinking based on your food sensitivities. Personally, I am sensitive to gluten, sorghum, corn and yeast to just name a few. So the gluten sensitivity eliminates beer for me and the sorghum even eliminates gluten free beer, since it is typically made out of sorghum. The corn sensitivity removes many other choices due to the use of corn as a sweetener and the high fructose corn syrup typically used in mixes. The yeast also eliminates beer and most wines also. So you may ask, what is left? First off, if you are drinking a spirit that is derived from gluten or another protein source that you are sensitive to, this is OK as long as the spirit is distilled. The distillation process does not allow the gluten or other proteins to cross over. This is not the case with beer and wine though. If you are gluten sensitive beer is off limits and if you are like me and also sorghum sensitive, the gluten free beer is also a no/no. As long as you are not sensitive to yeast, wine is most likely fine for you. If yeast is an issue, wine should be avoided unless you are lucky as I am. Fortunately I am friends with wine makers and I can request the use of a rather expensive (but worth it) filter, to filter out the yeast. I typically have a case of yeast free wine that I can drink through the year and no, I do not share it. LOL! I am also very careful about my drink of choice. If you are drinking these concoctions that are sugar filled and you cannot even taste the alcohol, think again. Drinking drinks of these types can most often lead to over consumption because they simply taste so good and "sneak" up on you. One of my favorite drinks when I go out and indulge is an Anejo tequila on the rocks with about a half of a lime squeezed. This would lead to sipping and not gulping and I can easily "nurse" one or two of these for the entire evening. For that matter, "nursing" any cocktail is truly the key. There are other positive choices that you can also make when drinking. Typically when I drink, I will not have another drink until I have had at least a 16 ounce glass of water. Many times when you get "hung over" dehydration plays a significant role because most will replace water with alcohol, not even thinking that the alcohol itself will dehydrate you. I would also add that you should make sure you are properly hydrated prior to drinking. Another positive choice that I make when I drink is that I always take 4 capsules of Luvos when I drink. Luvos is a clay from a mountain region in Germany that is the most absorptive material on earth. Taking this will actually absorb the alcohol in the gut and carry this out the body with much lower absorption. The less you actually absorb, the less damaging to your body and your brain. Typically after drinking I also take a gut restorative supplement and heavy amounts of antioxidants to help the body with any damage done. This may or may not sound like a lot to you, but it is worth it when putting something into your body that is less than optimal, which is the case with alcohol. There is another subject to address and this is why you are drinking. If you are drinking socially and have control over how much your drink, or if you simply want to take the edge off your day on occasion, drinking can be a part of your lifestyle. If you are drinking beyond these levels, you may have some work to do. So look at your own drinking habits and recognize that you are drinking for the reasons below, you may want to reach out for some help. Now of course there are other reasons that we may need to reach out for assistance but at least you have a start here. I still want everyone to recognize that I do not feel that any alcohol is good for you health but we have to be real, most of us will drink in our lives. If we can at least follow some simple tips, the negative affects of alcohol can be minimized and you do not have to suffer from a health perspective. There is yet another point to be made. I personally do not drink any alcohol at all for at least one six week period every year. During this time, I will typically make up my own "fun" to replace drinking alcohol. I may take a martini glass and shake some mineral water with muddled blueberries and ice and poor this into my glass. The fizz, muddled blueberries, all chilled and in the "fun" glass makes a more than adequate replacement for a drink. Often times, if you take this approach, you will find that that alcohol itself is not what you're looking for. It's just that you want something perceived as fun and after all, with the stressful lives most of us live, isn't a little fun welcomed. I would suggest you take on a six week vacation from drinking yourself. If you cannot, seek assistance. Please, if you do choose to drink, always drink responsibly and never drink and drive. It's simply not worth it for yourself or others on the road. Great article, thank you Glen. Good suggestions. I occasionally have a Vodka Tonic mad with Q Tonic (sweetened with organic Agave) and Ocean Vodka (made from organic sugar cane) and lime. At least a little lower glycemic index, I guess. Thanks again. Always my pleasure and so happy that you enjoyed this. Another good spirit is Veev, which is produced from the acai berry. You are right on with your information and it is "interesting" that when we see the research on Italian's drinking wine, we never hear about the these important points. Ugggg...I read through my article 3 times and cannot find where I misused "your." LOL! "...also eat some fat as your drinking"
"...alcohol itself is not what your looking for." Oooops... spelled "Italian" wrong.... shame ! Great article. I enjoyed your perspective. Would Bentonite clay be the same as the clay you were mentioning? Also what kind of gut restorative product? Probiotic? L-Glutamine? Bentonite clay would provide a similar benefit but nothing reaches the capacity of the Luvos. I recommend Repairvite which is a combination of L-glutamine, DGL and aloe vera extract. Probitoics are simply a necessary overall positive gut supplement.